This Pebble Light is a minimalist decorative feature inspired by contemporary east-Asian style. 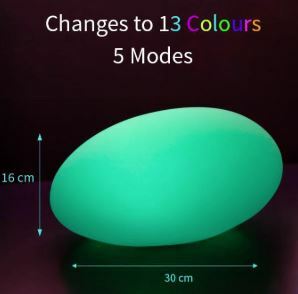 It looks good even when it isn’t glowing in one of the thirteen colour choices! 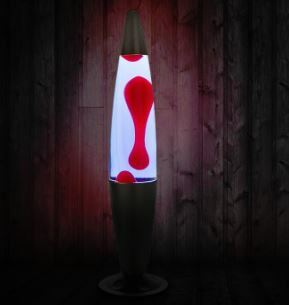 All you need to do is charge it up and you can put it indoors as a feature or outdoors in your garden. It’s a great feature for parties as it adds vibrancy to any space and is a great design piece to inspire you every day in your home. Cost about $50. Comes with a charger. This attractive table is perfect for coffee and snacks. 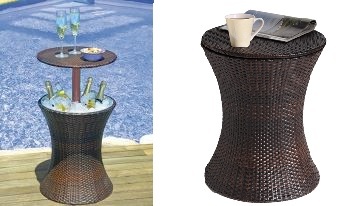 Then, when you pull up the top to reveal the steel ice bucket, you can enjoy cool and refreshing wine, beer and soft drinks without constant trips to the fridge. 44 cm in diameter, it adjusts between 56 cm and 95 cm in height. The plastic rattan-effect finish wipes clean and the bucket is easy to empty – just remove the plug for the melted ice to flow away. The high-grade stainless steel design ensures a quick heat up time, even heat distribution and maximum heat retention when cooking. Clean up is hassle-free with an easy wipe down. Equipped with carrying handles, the Firebox is easy to set up on the BBQ and convenient to store once you’re done. 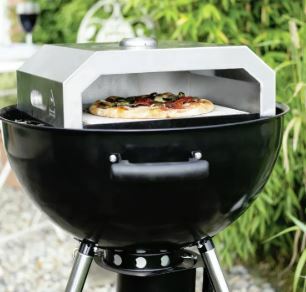 Compatible with any gas or charcoal BBQs, use the portable Firebox Pizza Oven in the comfort of your own backyard or bring it along on picnics with the family. The Firebox pizza over costs around $100. 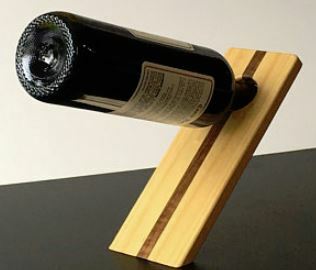 This item is so simple in design and practical. Great talking piece around the dinner table. Or when, you are sitting with friends in the living room. You can use your own imagination and design your own. Prices for this item can vary from $8 to $60.